I've posted a recipe before for carrot muffins (Spiced Carrot Muffins), and they are delicious, but I just had to share with you the recipe for my all time favourite carrot muffins. 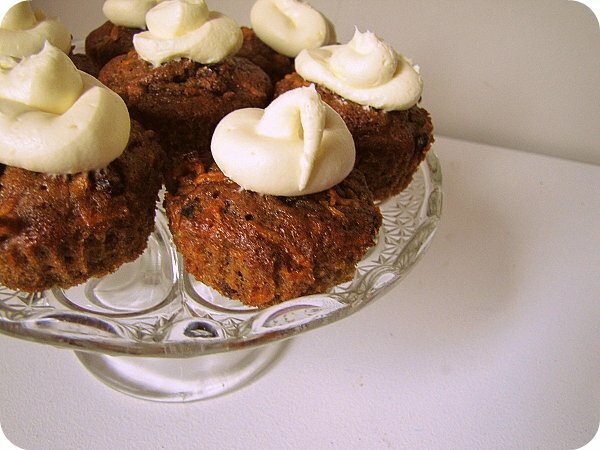 These are the carrot muffins my Mum always makes and I love them! So moist and delicious, she usually serves them up without any icing, but cut in half and spread with a bit of butter. The walnuts give them an amazing crunchy texture, although you can always leave them out if walnuts aren't your thing. Mix all of the dry ingredients together in a bowl. In another bowl mix the wet ingredients together. Tip the wet mixture into the dry and mix until just combined. Spoon batter into prepared muffin tray and bake for about 20 minutes at 180°C. Makes 6 large muffins, or 12 medium. mmm yum - might have to make some these hols! I can smell them over here! be there is a jiffy!!! Hi JuRita - couldn't find your email to send you back my answers, so here they are! Sultanas are dried green grapes - sweeter than raisins (from dried red grapes). Yummo, I'm going to have to try this recipe - thanks for sharing! Those look fabulous and the little dollop of icing....yuuuuumm! How easy is that recipe! P.s. my thighs don't like you very much!! I just made these last night and they are amazing!! I think I'm going to make them this Saturday with my vacation bible study kids! Good way to get them a veggie, hidden in yummy good-ness. Haha! I can see why you favor them! YUM! Only 3/4 cup of flour?